Today is the first Saturday of May which means the debut of our May Leading Lady, Yoonsun Hur! Yoonsun is an amazing talent with the ability to incorporate elegance with sweetness with ease. 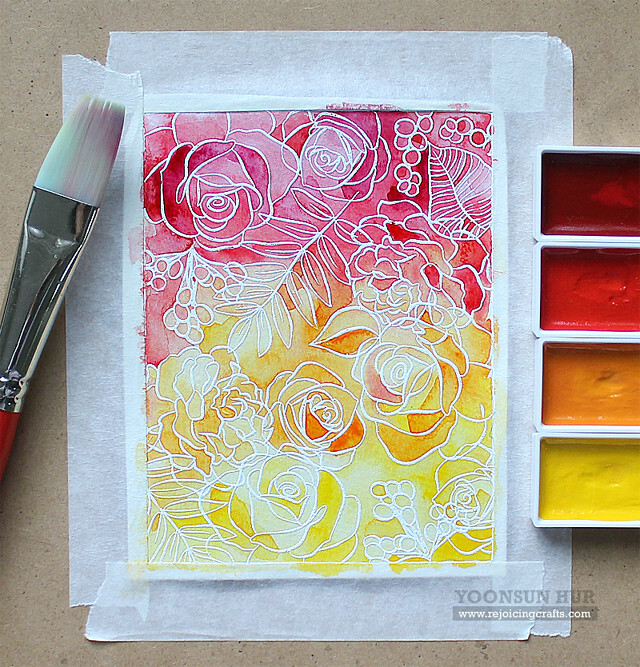 Yoonsun's grasp of color is truly amazing! Originally from South Korea, she now lives down under in Australia with her husband. Not only is Yoonsun adept at cardmaking-- working on the design teams of Altenew, My Favorite Things and Simon Says Stamp-- she is also a gifted graphic designer. This month she will be taking us all on a creative journey of her own design sure to leave us inspired. Please give Yoonsun a big round of applause to welcome her as she steps onto the stage for her first performance as our May Leading Lady! Today I will be sharing with you my watercolor floral background with the In Bloom:Elsa's Flora & In Bloom: Renee's Leaves stamp sets. I started by heat embossing outlined flowers and leaves from two flower stamp sets (In Bloom: Elsa's Flora & In Bloom: Renee's Leaves) on watercolor paper in white. I stamped images using Versamark embossing ink, and then heat embossed with white embossing powder. I then watercolored the stamped background with Kuretake Gansai Tambi Watercolor and a wet flat brush. I applied clean water on the panel first, and then added warm colours. I used (dark to light) No.36 Wine Red, No.32 Red, No.33 Orange, No.43 Mid Yellow. For the main image, I decided not to color. 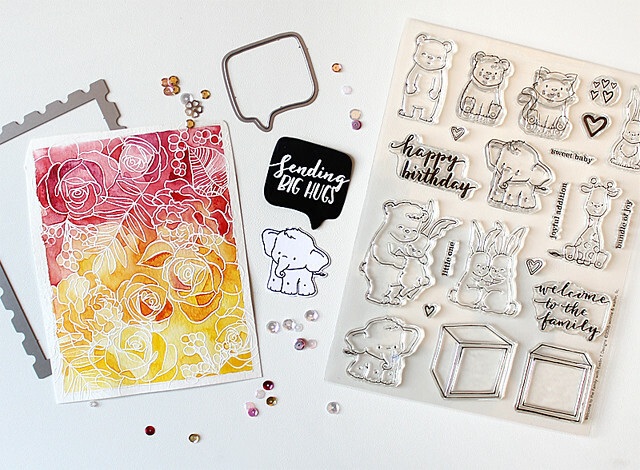 I just stamped an adorable baby elephant from the Welcome to the Family with Evelin T Designs set in black ink, and then die cut it with the Welcome to the Family with Evelin T Designs Cutaways. 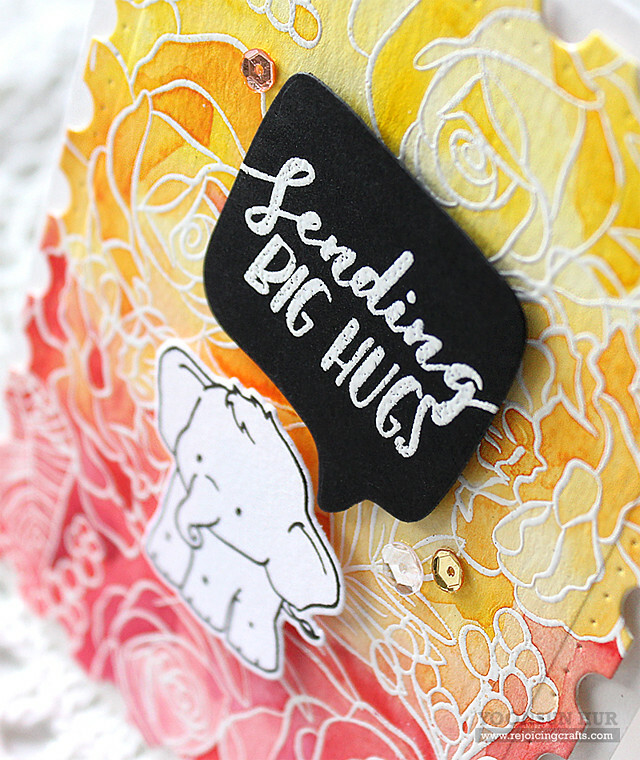 For the sentiment, I heat embossed “Sending big hugs” from the Big Hugs with Evelin T Designs set on black card stock in white, and then trimmed it out with the Sketchy Thoughts Cutaways. Once the watercolored panel was completely dry, I trimmed it out with the larger rectangle panel die in the Essentials: Lana Cutaways. Finally, I mounted all elements as shown to top-folded white card base using foam tape. 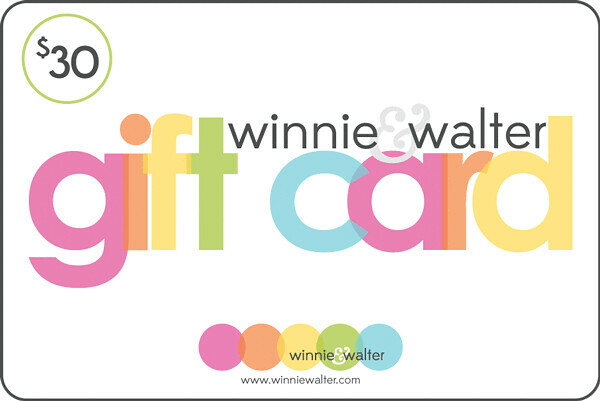 Shay has generously donated a $30 gift card for me to give away on my blog. To be in with a chance of winning, just leave a comment on my blog (https://rejoicingcrafts.com/). I’ll see you next Saturday for my second post. I've always admired Yoonsun's work--perfect Leading Lady! You've inspired me to do a background like this with the W&W stamp sets I have--thank you! Oh, this is just beautiful!! 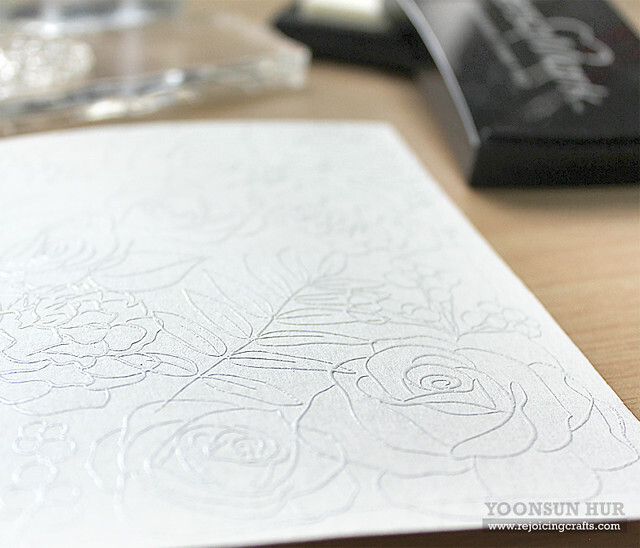 Such lovely white embossing and beautiful watercoloring. Sweet little ellie, too, of course!! I'm a big fan of Yoonsun's beautiful work! This card is fabulous! Love that watercolored background! 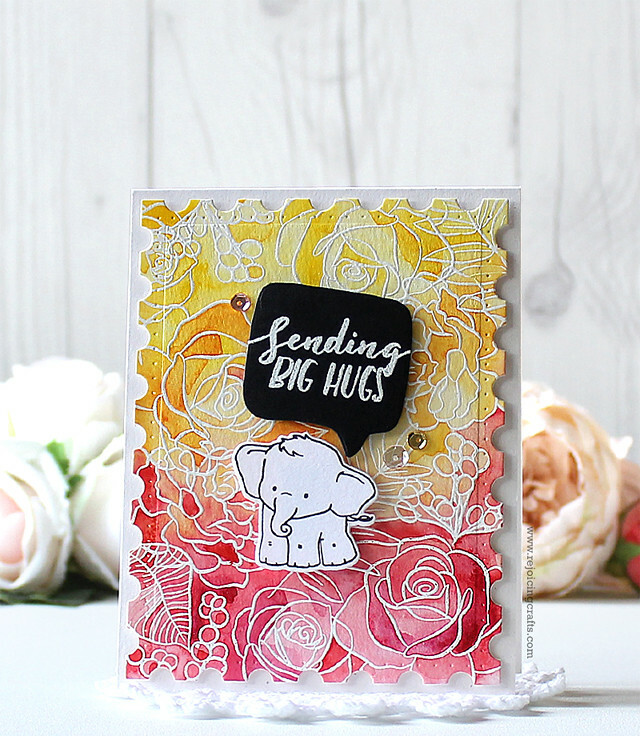 Beautiful card :) love the sweet lil baby elephant and the pretty background. I'm so glad Yoonsun is being featured as I love her work! This card is truly gorgeous and the combination of a watercoloured flowers background with the baby animals is really inspiring. Thanks for sharing! I LOVE Yoonsun's cards!! She is one of my fave cardmakers! This is another amazing creation from her! Beautiful rose background for this cute elephant. This is a beautiful card! I love the colors in the background, plus the little elephant is adorable! 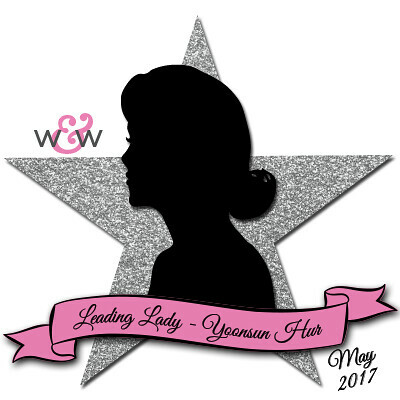 Congrats on being the May Leading Lady, Yoonsun!!! As always your creations are amazing and this card is simply adorable!!! Love the gorgeous colors and sweetness of this little elephant!!! Wow!! These are so beautiful, and a creative use of heat embossing with water coloring. Looking forward to seeing your creations this month. Just gorgeous! I always admire Yoonsun's projects. 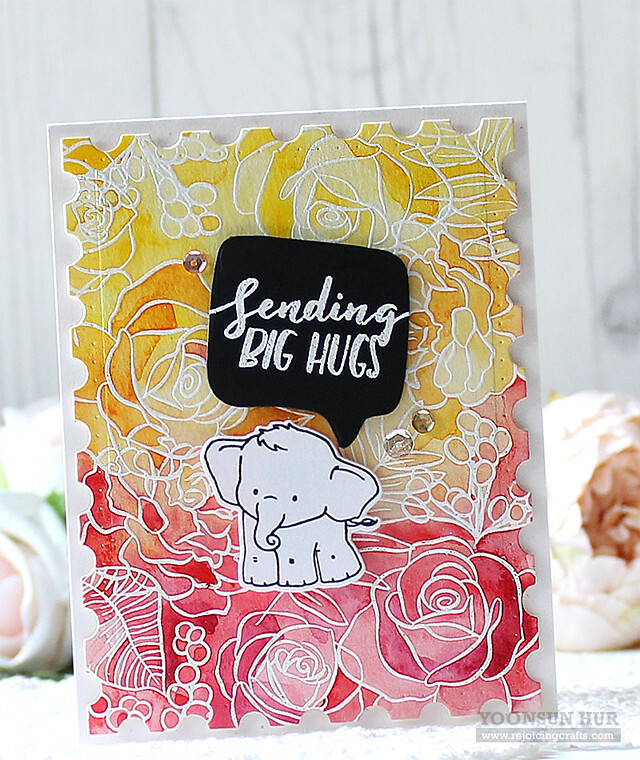 Gorgeous card design, love the background in combination with the white elephant! It was an icky, chilly day when I read this post and I got inspired. I CASE'd with the rose stamp that I had and managed to create 3 cards with my water colored piece. One I turned into a Mom's day card. Thank you so much for the inspiration and the tutorial. Helped me gain stellar results.